The current controversy over the burkini has electrified French society and launched a thousand memes. 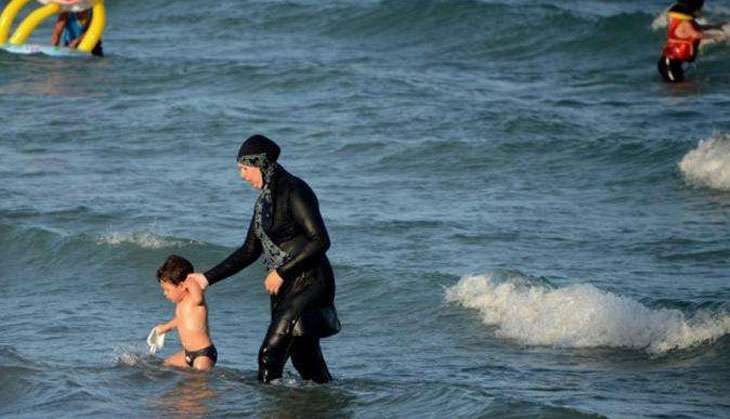 Pictures of Nigella Lawson wearing a burkini on Bondi Beach and nuns paddling on a French beach in their religious garb show how selective and ridiculous the burkini law is. But controversy over women's clothing, and competing cultural notions of appropriate garb, are nothing new. During the 1860s, a trickle of single English women migrated to Australia in search of work, funded by the Female Middle Class Emigration Society. Most of these women were in their late twenties or thirties, so they had missed the marriage market. Their best hope of economic security was to become governesses, a "white blouse" occupation that required, above all, respectability and accomplishments. You might be lousy at teaching mathematics, but your manners must be beyond reproach. One woman experienced disaster on the voyage out: several weeks away from Australia, she was walking on the deck when a sudden gust of wind blew her bonnet overboard. It was an appalling loss for her, because without a bonnet, she couldn't go up on deck or appear outside where she could be seen by the crew or the male passengers. Going bareheaded would be unthinkably bold. I'm quite sure she could have bought or borrowed a shawl from one of the emigrant women in steerage, or rigged up a kerchief of some sort using a petticoat or bed linen, but a bonnet was important, because it showed her middle-class status. Instead, she spent the rest of the voyage in her cabin, unable to enjoy fresh air or exercise until the ship reached port. At about the same time, throughout the Pacific, missionaries were busily introducing Islander women to the delights of the Mother Hubbard, a shapeless, loose cotton dress with a high neckline and long sleeves, which concealed all those parts of the female anatomy that the women concerned had not previously realised needed concealing. Eventually most Pacific Island women adopted the Mother Hubbard, because it became a symbol of Christian conversion, and variants like the Hawaiian muu-muu are still worn. How did those Islanders who did not adopt the Mother Hubbard feel? Forms of clothing that emphasise extreme modesty can feel like an implied rebuke to those who don't wear it. Clothing carries many messages - class and respectability in the case of a bonnet, religious affiliation in the case of the Mother Hubbard or the burkini. In the 1950s, the bikini symbolised modernity and youthful rebellion. Its very appeal lay in its immodesty. Naturally the Gold Coast embraced the bikini - think of the Meter Maids - and within a few years its transgressive impact had gone. At the same time, southern European immigrants began arriving in Australia. Inevitably given the long years of war in Greece, Italy and the Balkans, there were many older, widowed women amongst them. These immigrant women wore the traditional widows' clothing of a black dress, black headscarf, and black stockings and shoes. They were a haunting alien presence, and locals found the clothing confronting. For centuries, women's bodies have been policed to ensure that they cover up whatever parts are deemed immodest or dangerous, though the parts concerned keep changing, from bare ankles to bare heads to bare breasts. "Provocative" clothing lies in the eye of the beholder, so it is ironic that in the current French situation, women are being policed for covering their bodies too much! Men's clothing is sometimes politicised too, often as a symbol of modernity. In the 19th century, the Ottoman Empire banned the turban as old-fashioned and inappropriate in the modern world, and replaced it with the fez. A century later Ataturk banned the fez as old fashioned and promoted the Homburg hat. The change was part of his drive to secularise the nation: an observant Muslim can place his forehead on the ground in prayer while wearing a turban or a fez, but not while wearing a hat with a brim. Usually, though, it is women whose clothing is policed - or who police themselves. Men play a role, especially when a form of clothing is treated as an outward and visible sign of religious faith, for men are the traditional gatekeepers in religious observance. But whether as an act of rebellion, or as a symbol of adherence to old ways, clothing - and its lack - has the capacity to make us uneasy. Quite often that's the whole point.